Installing a new shower enclosure for your bathroom is a worthwhile endeavor that begins with a plan. You can depend on our competent staff to assist you at every stage of the installation. Whether you decide on a single shower door, a corner unit, or an inline, doorless enclosure, we are always available to answer any questions you may have. Before actual work begins we work closely with the homeowner to establish goals of the project and the materials needed. This is determined by the type of shower desired, the size of the bathroom area and by calculating how much of the shower area will require preparation. All bath tiles, walls, ceilings and floors must be prepared in advance. As soon as you've chosen the type of shower enclosure you prefer and any desired accessories to be added, your order will be placed. We then schedule an appointment date to examine the bathroom and determine a plan for your shower door installation. Our installation team will take exact measurements of the shower area; accuracy is a must so that the glass will be cut for a precise fit to the dimensions of your enclosure. A perfect fit helps prevents water leakage. We control every phase of the installation and never sub-contract or outsource your project. This is the defining quality of our work and the main reason we employ and train our own installers. The glass arrives at your home and is carefully fitted and placed into position forming the shower stall. Depending on your choice, the resulting enclosure is either frameless, or framed style. In addition to a precision installation, we use superior tempered glass and the highest quality materials. You can be confident that no matter which design you've chosen, your shower surround is guaranteed to provide many years of hassle-free use. The final stage of the installation is an examination of the shower to ensure proper alignment. 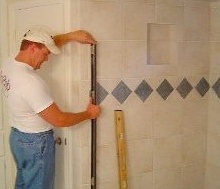 Our professional installers take the time to inspect each shower thoroughly. Installations are tested to ensure that trim joints, contact layers and glass edges are properly joined, assuring a tight water seal. We take pride in providing our customers with a functional and attractive shower enclosure they will enjoy and admire. Call our store and take that first step toward a new custom shower enclosure for your home. We'll be delighted to talk with you to discuss your project and answer any questions that you have. Find out just how easy it is to remodel your bath. If you're interested in cost, phone or send a request for a free price estimate and we'll respond promptly.